Visit the official website for UPSEE and click on the "Download Admit Card" link. Enter UPSEE application number and password. Click on the "submit" button. Download and take a printout of the UPSEE Admit Card for further reference. Dr. A.P.J. Abdul Kalam Technical University (AKTU) formerly Uttar Pradesh Technical University (UPTU) will release the UPTU admit card 2019 on April 15. 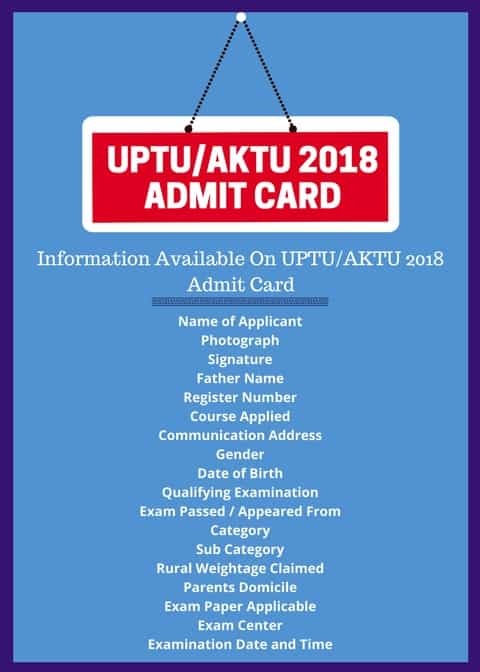 Availability: The AKTU/UPTU Admit card will be available on the official website of UPTU/UPSEE 2019. Date: The (UPTU/ AKTU) UPSEE Admit card Download 2019 will be available from 15th April 2019. Cross Check Details: The AKTY/UPTU admit card is equivalent to a hall ticket. The candidates are advised to check the details of (UPTU/ AKTU) UPSEE 2019 admit cards with regards to their category, sub-category, gender, rural, examination centre, Name, Father's Name etc. Note: Candidate will not be allowed to appear for the examination without AKTU/UPTU admit card 2019 and the downloaded admit card will be considered as a valid admit card. Candidates need to carry a hard copy of the admit card to the exam centre. The candidates are advised to carry an extra copy of the (UPTU/AKTU) UPTU admit card 2019 so that he/she will be on safe side if the original copy is misplaced. Valid Applicant: AKTU/UPTU Admit card will be issued only to those candidates who have filled the UPTU application form and completed the (UPTU/AKTU) UPSEE 2019 application process properly. If there are any issues with the application form then the admit card will not be issued. Candidates are advised to verify the details mentioned on AKTU/UPTU 2019 Admit Card. The UPTU admit card download will be available only to the eligible candidates from the website portal. Candidates will be required to log in and download the UPSEE admit card. Candidates must follow the below steps to download the admit card successfully. Step 1: Aspirants should visit the (UPTU/AKTU) UPSEE 2019 official website and click on "Download Admit card for UPSEE 2019" link. Applicants can make use of link provided below to download their UPSEE 2019 Admit Card. Step 2: Enter your (UPTU/AKTU) UPSEE 2019 application number, password and security pin. Click on "sign in" button. Step 3: Admit card will be displayed on the screen. 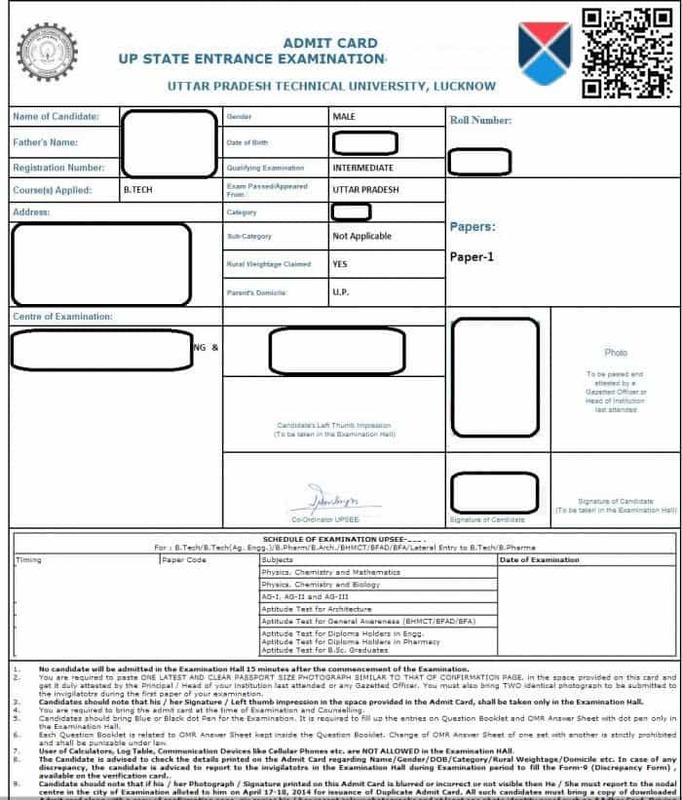 Download and take the printout of (UPTU/AKTU) UPSEE 2019 Admit Card for further use. Withdrawal of Permission to Appear for UPTU: A candidate failed to receive the information for appearing at the (UPTU/AKTU) UPSEE 2019 Examination will not be accepted. (UPTU/AKTU) UPSEE may withdraw the permission to appear in (UPTU/AKTU) UPSEE 2019 granted by mistake to a candidate who is not eligible to appear at the (UPTU/AKTU) UPSEE 2019 exam even if an admit card has been issued and produced by the candidate before the concerned centre superintendent at the examination centre. Importance: The candidates must preserve the (UPTU/AKTU) UPSEE 2019 admit card until the admission process is over. The (UPTU/AKTU) UPSEE 2019 admit card is required for the verification and authentication in the counselling process. Discrepancies: Any discrepancies in the (UPTU/AKTU) UPSEE 2019 admit card or if any candidate is not able to download the (UPTU/AKTU) UPSEE 2019 admit card then candidates must contact the (UPTU/AKTU) UPSEE exam conducting body through the helpline as indicated on the AKTU official website. No Tampering: The (UPTU/AKTU) UPSEE 2019 admit card should not have tampered. If any of the candidates (UPTU/AKTU) UPSEE 2019 Admit Card is found to have tampered then candidates may be barred from writing the (UPTU/AKTU) UPSEE 2019 exam. Plagiarising the (UPTU/ AKTU) UPSEE 2019 admit card is a punishable offence. All the candidates must note that admit card of UPSEE #yearis an important document and must be kept safe. No candidate will be allowed to enter the examination hall without the UPTU admit card download. In the case, candidates are unable to download the application form, they must write to the officials of AKTU admission with all the particulars related to UPSEE 2019 examination at helpdeskupsee17@gmail.com within the dates specified. Step 1: In the UPSEE 2019 Admit Card portal click on "Forget Application Number" link. Step 2: Then select the appropriate course (UG / PG) and click on "Get Application Number" button. Step 3: Enter candidates name, father name, mother name, date of birth, security pin and click on "Get Application Number" button. The UPSEE 2019 application number which matches the submitted details will be displayed on the screen. Step 1: In the UPSEE 2019 Admit Card portal click on "Forgot Password" link. Step 2: Select the preferable mode to recover the password and click on the "Continue" button. Step 3: Enter your application number, date of birth, security pin and click on the "submit" button. Then the appropriate password recovery method is processed according to the mode selected. Where can I get my UPSEE admit card? You can download your UPSEE admit card from the official website(http://www.upsee.nic.in). Suppose a candidate is not able to carry his/her UPSEE admit card due to some reasons what should he/she do? What is the procedure to download the UPSEE admit card? Enter your application number along with the Password. I am a UPSEE applicant. May I know when my Admit card will be released? The Admit Card for UPSEE 2017 will be released on 7th April 2017. Is it necessary to carry original mark sheet of Qualifying examination or marks will be verified from photocopy of mark-sheet? It’s necessary to carry original mark sheet of qualifying examination. Marks will be verified from the original mark sheet only. You must produce original mark sheet at the time of document verification. Will Admit card be sent to me by post?